Two people have been taken to hospital following the "world's hottest chilli" competition at an Edinburgh Indian restaurant. Emergency services were called to the Kismot restaurant in St Leonards Street on Saturday afternoon after some competitors became "very unwell". 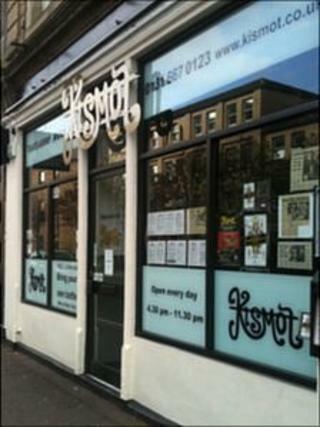 The competition involves people eating the "Kismot Killer" curry. The Scottish Ambulance Service is now calling for a review into how the event is managed. On the restaurant's website it insists that participants sign a legal disclaimer before taking part in the competition, which raises money for the Scottish children's charity Chas. It is understood that members of the British Red Cross were on hand at the event, but the Scottish Ambulance Service still had to be called because two people had such a violent reaction. Curie Kim, 21, an American student on an exchange to Edinburgh University, said she decided to enter the challenge when she saw it advertised in the restaurant. She told the BBC Scotland's news website: "It was very painful and felt like I was being chainsawed in the stomach with hot sauce on the chainsaw. "I have learned my lesson and will never do it again and, in fact, I will be cutting down on my spice intake full stop." Ms Kim came second in the contest. "The woman who won ate the last bowl in four seconds and then ran outside to be sick where as I didn't so I've learned I should have had a game plan like that," she said. "I was in so much pain I wasn't aware of what was going on around me and when I got to hospital they gave me medicine for the indigestion. "I don't think the restaurant should do it any more as I think there are a lot less painful ways to raise money for charity." Organiser Abdul Ali said: "The British Red Cross we had on board could not cope. We put our hands up. We did have to call the emergency services for a couple of our participants." A spokesman for the Scottish Ambulance Service said: "Two patients were taken to Edinburgh Royal Infirmary after becoming very unwell at Kismot restaurant. "We would urge the organisers to review the way in which this event is managed in future in order to avoid another situation where emergency ambulances are required to treat their customers." Gordon Mackenzie, whose council ward covers the restaurant, called the event a "shambles" and said: "The owners owe a debt to the ambulance service, and I hope they'll find some way of making it up to them."